Divas---Womanly, worldly, catching their second breath. These women have it all together and are strutting their stuff. Applique either by hand or using fusible web with a finishing satin stitch. Embellish with rhinestones, metallic threads, embroidery and feathers. Use your favorite applique technique or use fusible web. 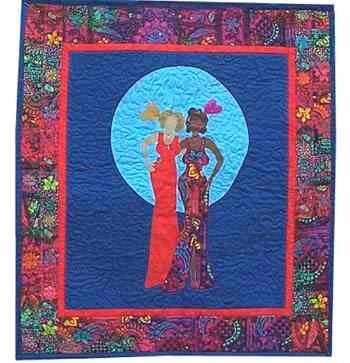 The sample features Malaysian fabric borders and one gown and African brocades for both blues.